Cameron McGeehan's superb strike gave Luton Town victory at Wycombe in League Two to extend the Hatters' unbeaten record at Adams Park to 11 games. 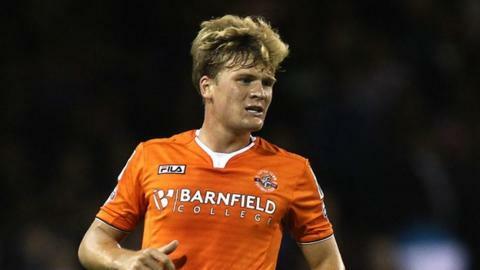 McGeehan scored his 10th of the season with a half-volley that looped over debutant keeper Ryan Allsop. The hosts, who drop to 10th, had the ball in the net after the break, but Paris Cowan-Hall's header was disallowed for a push on the keeper. Paul Benson hit the post late on for Luton as they held out for the win. "It's just a lack of goals for me, we dominated the first 35 minutes. I thought we were outstanding. We have got to stick them in, somebody has got to step up and say 'I'm going to start scoring for Wycombe Wanderers'. "With no money it is really tough to get players in, I haven't got a penny to spare, we will have to get players out before we get any more players in. "I cannot fault the efforts of the players today - it's just sticking it in the opponents' net, and we will be working on that." "I was really thrilled with the contribution from the Luton fans, they filled the away end and sang all the way through. We gave them a performance they can be proud of. "I'm so, so proud of them today - what a shift, what a graft, I'm really proud of my team. Today we showed a different side to us - in the second half, we were outstanding." Match ends, Wycombe Wanderers 0, Luton Town 1. Second Half ends, Wycombe Wanderers 0, Luton Town 1. Corner, Luton Town. Conceded by Marcus Bean. Craig Mackail-Smith (Luton Town) wins a free kick in the attacking half. Foul by Matt Bloomfield (Wycombe Wanderers). Craig Mackail-Smith (Luton Town) wins a free kick on the right wing. Paul Benson (Luton Town) hits the left post with a left footed shot from the left side of the six yard box. Joe Jacobson (Wycombe Wanderers) is shown the yellow card. Attempt missed. Michael Harriman (Wycombe Wanderers) right footed shot from outside the box is too high. Substitution, Luton Town. Paddy McCourt replaces Cameron McGeehan because of an injury. Substitution, Wycombe Wanderers. Luke O'Nien replaces Paul Hayes. Pelly Ruddock (Luton Town) wins a free kick in the attacking half. Substitution, Wycombe Wanderers. Aaron Holloway replaces Paris Cowan-Hall. Substitution, Luton Town. Pelly Ruddock replaces Jack Marriott. Foul by Michael Harriman (Wycombe Wanderers). Stephen O'Donnell (Luton Town) wins a free kick on the left wing. Attempt saved. Jack Marriott (Luton Town) right footed shot from the centre of the box is saved in the bottom right corner. Foul by Sido Jombati (Wycombe Wanderers). Paul Benson (Luton Town) wins a free kick in the defensive half. Substitution, Wycombe Wanderers. Garry Thompson replaces Gozie Ugwu. Substitution, Luton Town. Paul Benson replaces Joe Pigott. Corner, Luton Town. Conceded by Joe Jacobson. Corner, Luton Town. Conceded by Jason McCarthy. Matt Bloomfield (Wycombe Wanderers) wins a free kick in the defensive half. Foul by Jake Howells (Luton Town). Jack Marriott (Luton Town) is shown the yellow card. Foul by Gozie Ugwu (Wycombe Wanderers). Alan Sheehan (Luton Town) wins a free kick on the right wing. Corner, Wycombe Wanderers. Conceded by Jake Howells. Foul by Aaron Pierre (Wycombe Wanderers). Cameron McGeehan (Luton Town) wins a free kick in the attacking half. Paris Cowan-Hall (Wycombe Wanderers) wins a free kick on the left wing. Corner, Luton Town. Conceded by Sido Jombati. Corner, Luton Town. Conceded by Aaron Pierre. Sido Jombati (Wycombe Wanderers) is shown the yellow card for a bad foul.